While it may be warmer than normal for “soup weather”, this light and fresh spring vegetable medley is a delicious transitional dish for those of us who can eat soup any time of year! 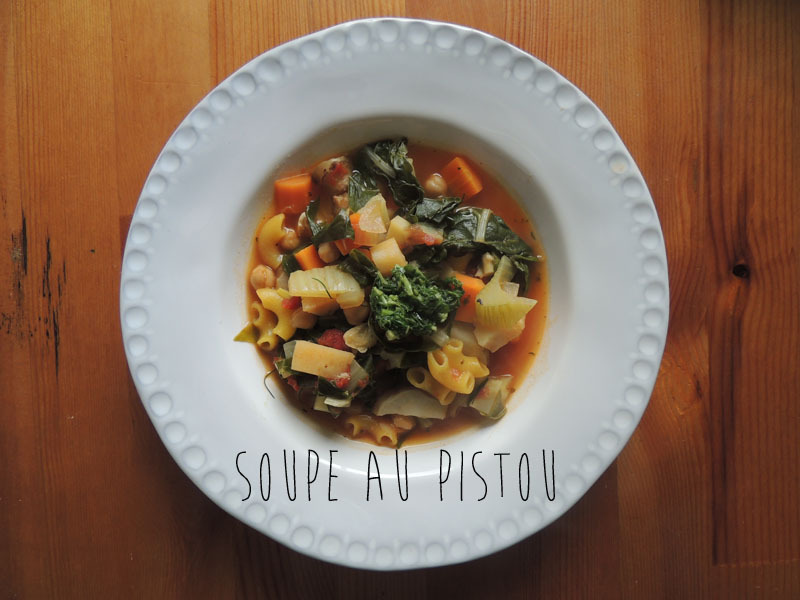 Pistou, the Provençal cousin of pesto, is stirred into this summer vegetable soup just before serving. I adapted this recipe from the Les Halles cookbook by Anthony Bourdain, and Love and Lemons (such a cute and healthy food blog), as I happened to pretty much have everything in my refrigerator! White beans are more traditionally Provençal than garbanzos, but they are what I happened to have, and I had a few topinambours left from the farmers market. 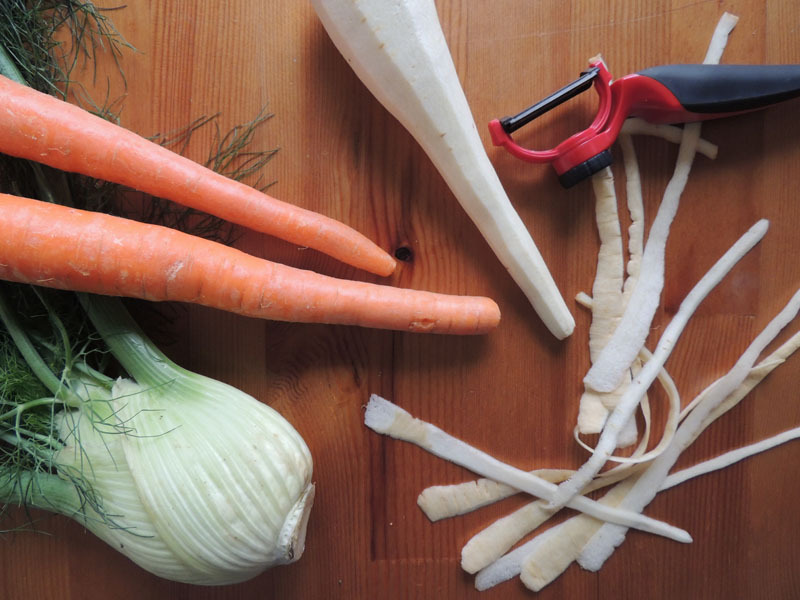 The pistou makes the soup so fresh and lively – I brought it to work and the smell of fresh basil and garlic wafted clear across the lunchroom (in a good way). You can definitely play around with this dish, as I’ve seen it with bacon/pancetta, celery, Savoy cabbage, and zucchini – add/subtract what you wish! In a 6 qt. heavy bottom soup pot (or Dutch oven), saute the shallots in olive oil until translucent, then add garlic (make sure you don’t burn it!). Then add the fennel, and continue cooking for a few minutes. Next, add the parsnips, carrots, herbs de provence, and topinambours and continue cooking, stirring every so often as to not brown the vegetables. After about 5-7 minutes, add the white wine to deglaze the pan. Next, add the broth, tomatoes, and beans, and let the soup gently simmer until the vegetables are tender, approximately 25 minutes (but do not overcook). Salt and pepper to taste. While the soup is simmering, make your pistou. 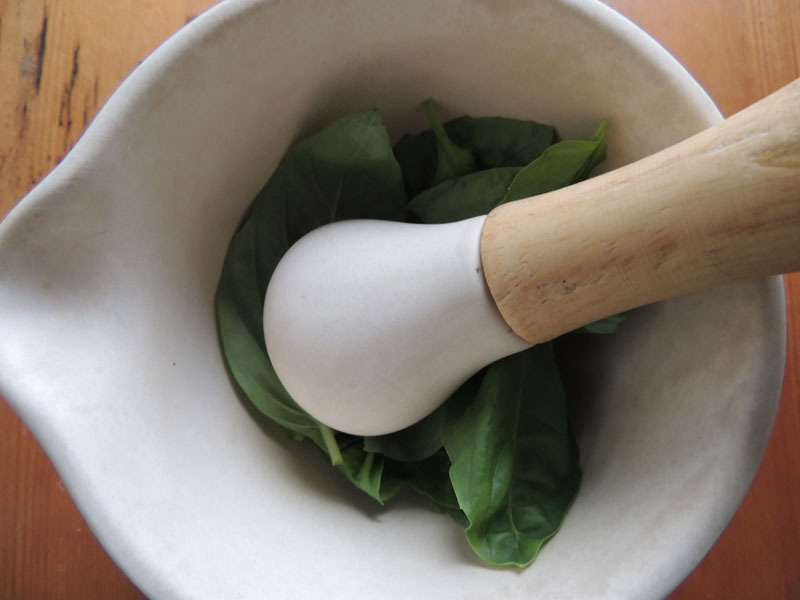 Traditionally, you would grind the basil and garlic in a mortar and pestle, then drizzle the olive oil in. I tried doing that, and it takes a LOT of elbow grease, so instead, I like to make pesto in my food processor. Add the basil and garlic, pulse until somewhat fine, add the cheese, pulse again, and then turn the processor on and slowly drizzle in the olive oil. Serve each bowl of soup with a nice spoonful of pistou on top and a slice of toasted levain. pork chops and cherry sauce.